I am thinking of which new things I would like to list on Etsy this month, possibly a few more of my vessels. More of my necklaces would be good, too. 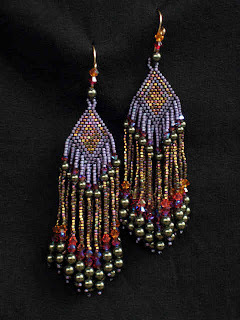 I have noticed that I don't have very many earrings included anywhere...I haven't made any in ages, so I should be thinking about that, too. And, of course, I am in the middle of two large collar projects as it is, and have three cuffs in mind to start...I don't have enough hands! It would probably be helpful if I would stop shopping Etsy quite so much, as I seem to find something new that I HAVE TO HAVE every week! No, I don't buy them ALL...really. Honestly. This is Teddy (Theodore H. Bear), who just turned 4 today! Dogs, beads, shopping, laundry, housework...life goes on!! Hello again! Here I am, sitting at my kitchen table, watching the rain fall from the gutters onto my deck. 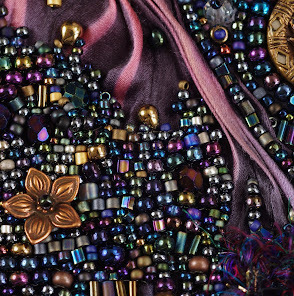 I am surrounded by beads, and had to make a place for the laptop. 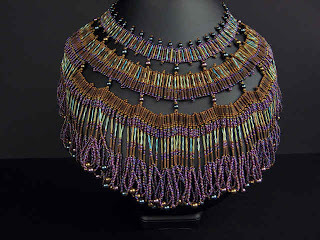 Pearls, gemstone chips and beads, seed beads in all sizes, bugles, crystals, flip tops and strands and baggies and a huge pile of bead soup in glorious hues of green, bronze, gold, browns and topaz, with a tiny hint of Montana Blue here and there. Coffee sits at my elbow. Doesn't it sound fantastic?! 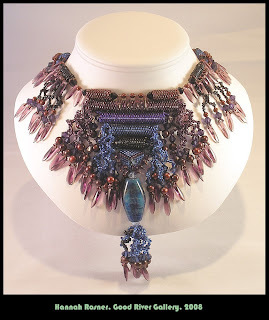 But instead of beading, I am blogging...at the moment! This particular design came to my mind about eight months ago and has been percolating ever since. It all started with a pendant made by the wonderful Chris Kapono at MandarinMoon on Etsy. 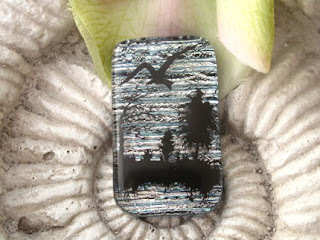 I was browsing her amazing shop, which is chock full of her polymer clay art, and there, low and behold, was a leaf pendant! I HAD to have it, but wanted to know if she could remove the bail, as I desperately wanted to use it as a cabochon. And off it went!! 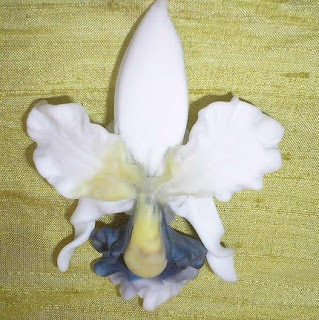 Pretty soon I was begging Chris to make me cabochons of all kinds, and asking her (nagging her, I think) if she would make me some more leaves. Fabulous being that she is, she some really wonderful ones for me...I hope you will be able to see the results soon - in about a month! 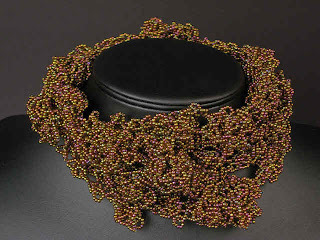 I am also in the middle of a different choker, more on the lines of Honeybutter, but in different colors and with a quite different feel to it. 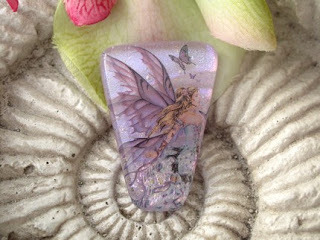 That one hasn't got any teaser photos, yet, but as soon as I can get my beautiful cabochon (it's on its way now!) attached to it, I will do some. 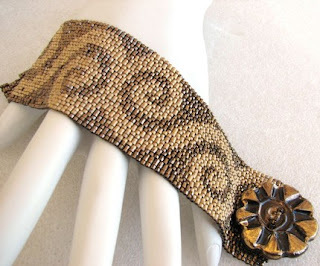 Her Golden Scrolls Cuff, which includes a gorgeous hand made button. Carol has been an incredible friend for me since I have been on Facebook, and she is so supportive and generous. Please visit her shop at www.sandfibers.etsy.com. 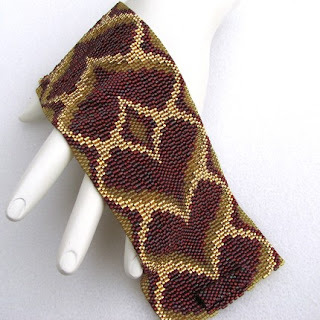 She is having a 3 for 2 pattern sale right now in both her Etsy and Artfire stores, and for anyone who wants to weave themselves a stunning cuff, this is an excellent opportunity to grab some really beautiful patterns!! !